The Celebrity Edge bars provide many drink options for all types of travelers. From the cruiser favorite Martini Bar and Sunset Bar to the unique craft cocktails in the new venue Eden, there are plenty of drinks to be had during your cruise. So, in the name of research, we set off to sample each bar and drink menu in our traditional “Drink Around the Ship” fashion. 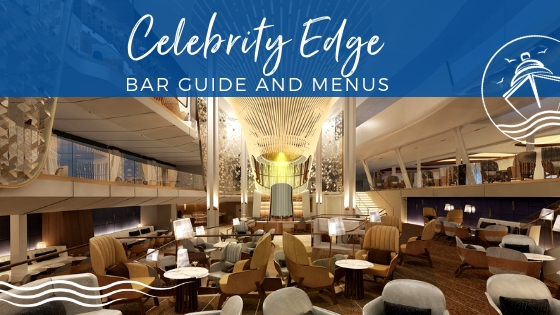 See the complete Celebrity Edge Bars and Lounges Guide with plenty of photos and all of the bar menus. Cheers! Exclusive for guests staying in suites, this reserved outdoor venue on deck 16 offers some of the best views on the ship. Along with having a complete bar that can serve up standard cruise drinks, there are a few exclusive offerings as well. The Retreat Bar also offers a complimentary menu of small bites in case you get hungry while lounging by the pool. Located aft on Deck 15, this aptly named venue is the perfect place to relax before or after dinner and watch the sunset. 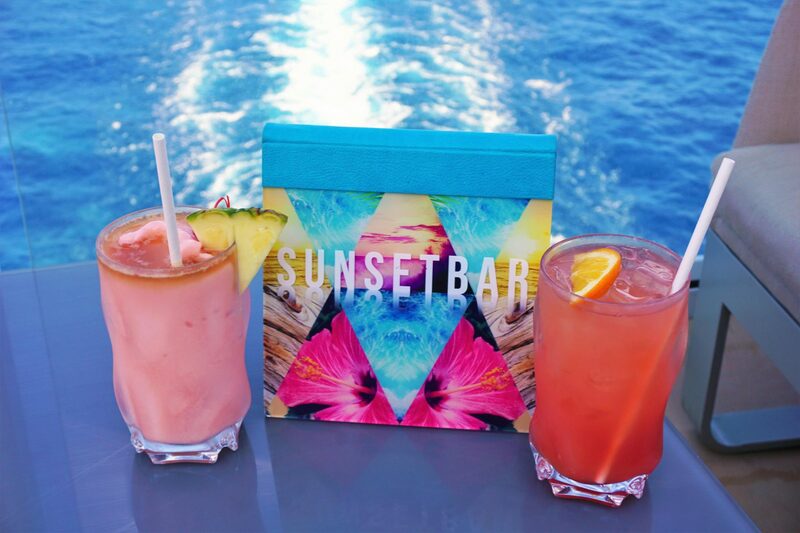 With a signature menu offering some of the most distinct beverages on the ship, we can’t blame you if you decide to head to this bar even before the sun hits the horizon. On most days, the Sunset Bar was open from around 10 am to midnight. We enjoyed a Sunset Pina Colada and Key West Daiquiri while watching the wake views. Celebrity Edge’s Resort Deck is unlike any pool deck at sea. This sophisticated and stylish deck feels like it belongs at a five-star hotel rather than a cruise ship. The Prism Bar is no different; this is not your typical pool bar. Serving up old favorites and new combinations, along with comfortable lounge furniture, this bar is open daily from 9 am to 7 pm. You can’t go wrong with go-to drinks like a Pina Colada or Miami Vice, or perhaps you will want to try something new like the exclusive French Caribbean. Looking to upgrade your pool deck experience? The Poolside Cabanas on the starboard side of the ship might be your best bet if you are not in a Suite. When you book one of the 6 cabanas, cruisers have their own private space that comes fully stocked with games, water, a selection of beers, and a bottle of liquor of your choice. A full food menu and additional specialty cocktails (that are part of the Premium Drink Package) are also available for purchase. You need to book while onboard, so check with Guest Services as they tend to sell out quickly. Perhaps one of the most comfortable and unique outdoor lounges is the Magic Carpet. 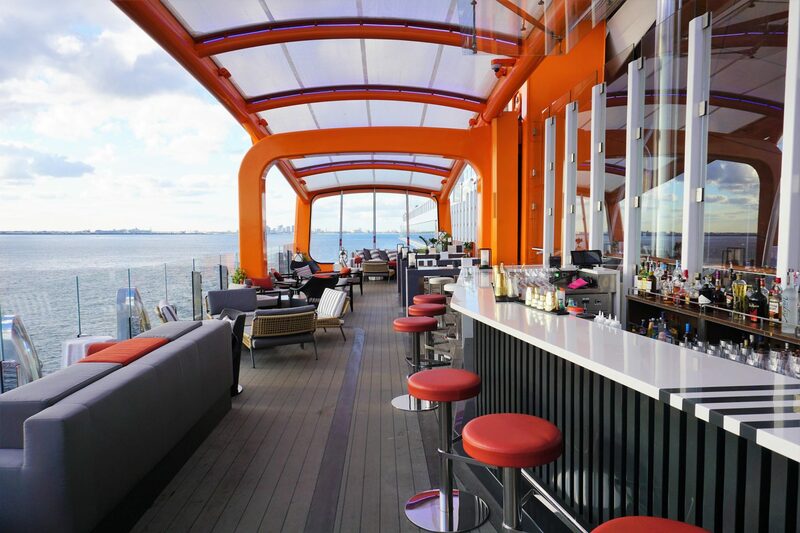 This venue offers a specialty drink menu and small bites but only while docked at Deck 5. When on Decks 14 or 16, the Magic Carpet serves as an extension of the pool deck with drinks from the standard bar menu. Given that the positioning of the Magic Carpet is weather dependent, days and times vary each cruise. For our trip, we were able to sneak in one evening while on Deck 5 for a quick drink, which included the aptly named Magic Carpet and the Sunset Daiquiri. This bar is located on the port side of the Oceanview Cafe. Along with serving as a stop for espresso, lattes, and other coffee specialties, it also doubles as your buffet bar. Offering select wine, beer, vitamin water, and a few mixed drinks, this venue is open over 18 hours, from 6:30 am to 1 am. It was a convenient place to get that early morning mimosa or a quick afternoon snack and a brew. Prepare for a one of a kind experience at one of the most exotic bars in the Celebrity Cruises’ fleet. This craft cocktail venue mixes up some of the most unique and adventurous drinks at sea. These concoctions come alive with the Library of Plants, a living wall where fresh ingredients and garnishes are picked for each signature cocktail. Eden was open most days from 10 am to midnight. The Princess fancied the Forbidden, while my first test of the Garden ended up being my favorite. While tasty, be warned that several beverages at this bar are above the $15 allotment on the Premium Beverage Package, and you will need to pay the difference plus 18%. 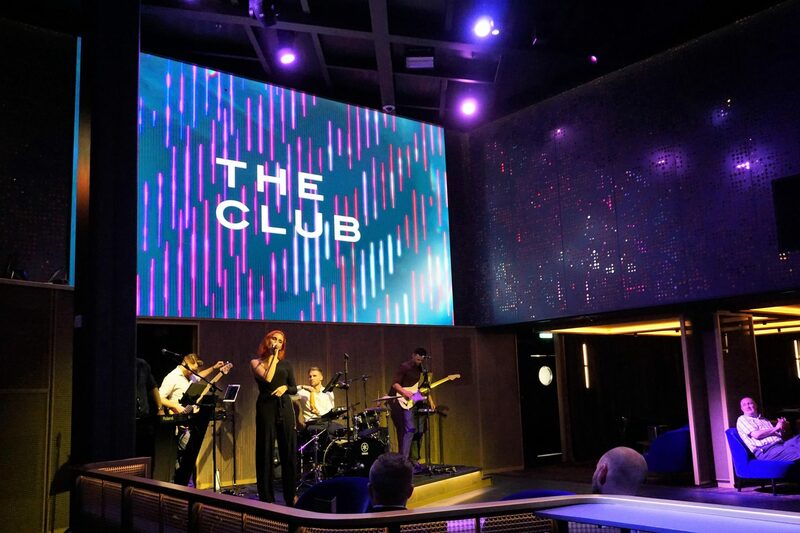 If you decide to try your luck at the casino during your cruise on Celebrity Edge, then you just might need to grab a drink from the Casino Bar. Sip your beverage of choice while playing your favorite slots or table games. This could be a great night if Lady Luck is on your side. Otherwise, you will at least need a drink to drown your losses. While the venue had no specialty menu, it was fully stocked with all of your favorite spirits and house beers and wines. This two-deck multi-purpose lounge is open day and night. During the day, it doubles as both an activity and entertainment venue hosting trivia, games, and other family-friendly fun. In the evening, this adults-only area comes alive with music and signature parties like the Silent Disco. Late-night cruisers can even dance until the wee hours with the resident DJ. Whether on the dance floor or relaxing in the ultra-hip lounge area, you can sip some musically inspired specialty cocktails off the signature drink menu. The bar at The Club was usually open by 4 pm and closed when the DJ stopped spinning tunes. Whatever cocktail you choose, you are bound to have a rocking good time at The Club. The go-to venue for java lovers, Cafe al Bacio on deck 4 is your coffee bar at sea. Serving up signature espresso-based drinks, coffee cocktails, and tasty sweet treats, this is the perfect spot to hang out and people watch day or night. Lattes and other specialty coffees/teas are included in both the Celebrity Beverage Packages. The Cafe opened most mornings between 6 am and 7 am and closed every evening at midnight. Possibly the most happening bar onboard Celebrity Edge is the Martini Bar on deck 3. Filled with an energetic crowd, highly talented bartenders, and a beautiful art installation, you will probably find yourself frequenting this venue for the specialty drinks and the show. 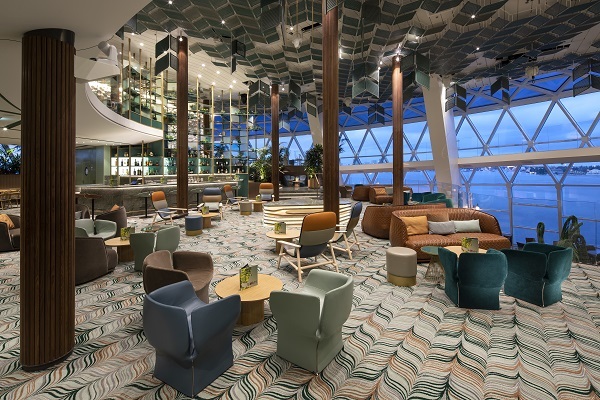 Even if you have cruised on other Celebrity Cruises’ ships, the Martini Bar on Celebrity Edge is unlike anything you have seen or tasted before. Get ready to be dazzled by this fresh take on the line’s signature venue. One of the Princess’ favorite cocktails was the Banana Fosters, whereas I stuck with the classics like the Manhattan. 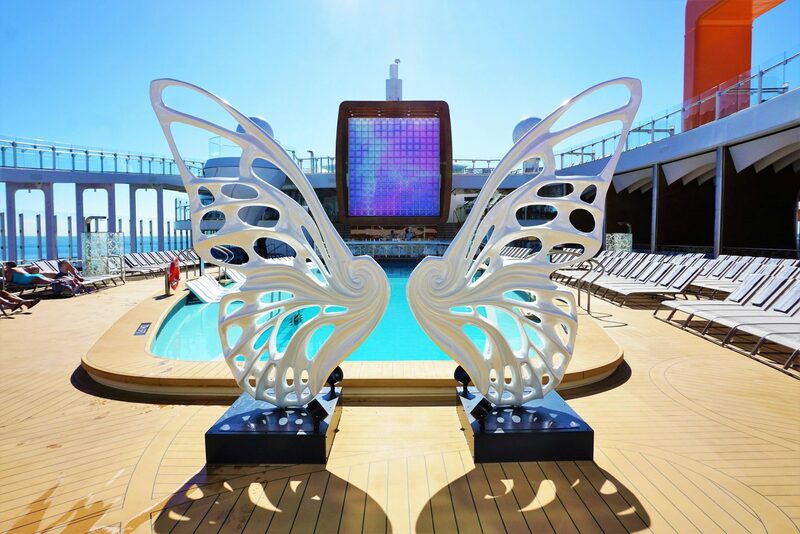 Have you sailed on Celebrity Edge yet? 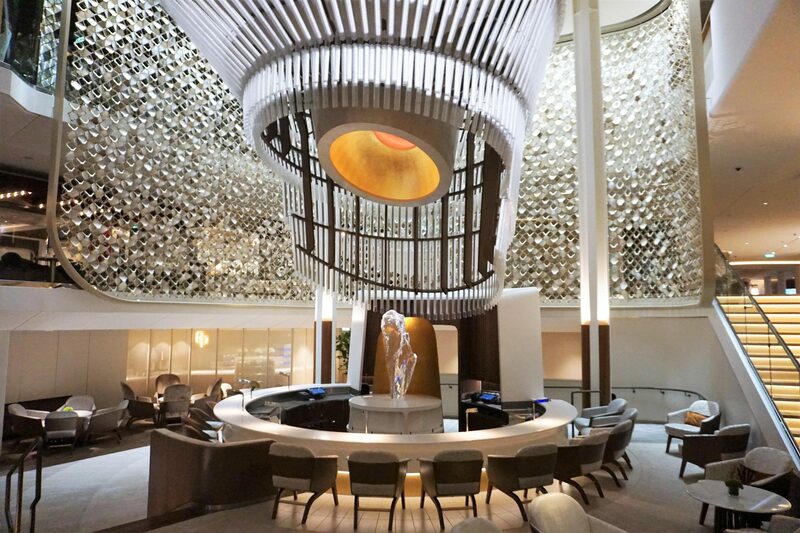 What is your favorite bar or lounge on this newest Celebrity Cruises’ ship? Drop us an anchor below to let us know your go-to spot for a cocktail while on a cruise.